We're really lucky at Extendicare! Our employees enjoy meaningful work experiences everyday, while enriching lives and helping people get better and live better! Jobs don't get any better than that! Extendicare is one of Canada’s largest providers of long-term care and home care. We've been in business since 1968 operating nursing and retirement centres across Canada and have used our many years of experience to put proven, practical solutions to work in Canada’s healthcare system. We are proud to offer our employees a respectful work environment, competitive compensation, advancement opportunities and the chance to be an integral part of a dynamic team. Most importantly though - Extendicare CARES! Our culture is based on Courtesy, Attitude, Responsibility and Excellence. But C.A.R.E. isn't justa clever acronyn for us - it's a way of work-life. When you join the Extendicare team, you join a team that values their residents, their patients and each other! We believe in mentoring our staff to help them gain the knowledge and skills they need to deliver exceptional service each and every day. 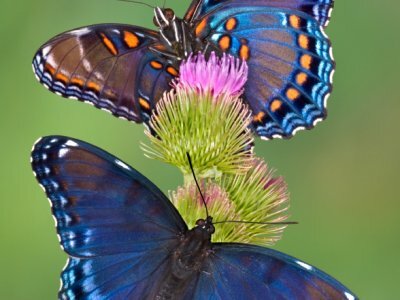 Our beliefs create workplaces where you will feel both valued and appreciated. Opportunities for advancement and career growth. Training and professional development programs. Competitive salary and benefits programs. An incredibly rewarding and meaningful work experience, and the ability to enrich both your life, and those of others. And they stay with us. We are proud of the dedication and commitment of our staff and this shows in the length of tenure that they have been with us. All regular full-time and regular part-time employees of Extendicare (Canada) Inc. are eligible for service awards. These awards are presented to employees who have achieved the required service levels (five-year increments, beginning at five years of service) at selected company functions throughout the year. 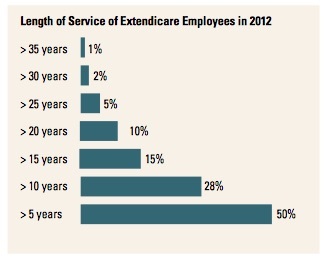 Within Extendicare (Canada) Inc., almost half of our employees have been with the company for 5 years or more and more than a quarter have been with us for at least 10 years. You’ve chosen a rewarding profession…Let Extendicare offer you a career!